""We usually take maturity for granted--one of life's givens,"" says Fischer, a former abbot of the San Francisco Zen Center. Many people equate biological age with spiritual maturity, a fundamental mistake. In this warm and simple book, Fischer draws from his experience as a spiritual mentor to four teenage boys and his well-honed dharma knowledge to impart nuggets of wisdom about""truly growing up."" While the book draws most heavily upon Buddhist examples--particularly the guru-disciple relationships that are a staple of the Zen tradition--it is wide-reaching in its approach, and would be accessible to people from other faith traditions or no faith tradition. There are Jewish talmudic stories and Christian examples, as well as relevant illustrations from popular culture and Fischer's own life. Fischer explores several values and activities that contribute to spiritual maturity, including listening, persistence, connection, meditation, vowing, and right conduct. Overall, he says, these values help people cultivate responsibility--the ability to respond appropriately in changing situations. While there's nothing that is earth-shattering in all this, the book has a freshness forged out of its stubborn insistence that spiritual maturity is something to consciously strive for. 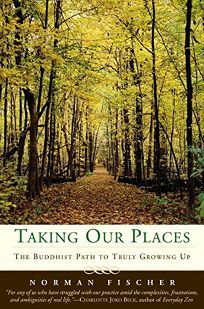 As Fischer writes,""The journey to adulthood can be lackluster if we only drift, but it can be profoundly valuable if we completely say yes to it and are willing to travel on wholeheartedly.""